Cats get in the way. What cats lack in size they make up for in sheer bloody-mindedness. Nothing, least of all an inelegant primate such as I, will interfere with their quest for the perfect perch, preferably on paper still warm from the printer, stacked in a box just a bit too small. Which is to say, cats get in the way. Recently I sent my publisher a revision of my forthcoming novel, in preparation for its fall debut. I went through the manuscript page by page, scribbling notes. I was at it for weeks, the loose pages corralled by a plastic box at my side. Usually there was a cat in that box: Percy, short for Perseus. Percy the cat is blind in one eye and suffers no fools. 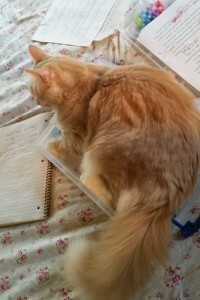 He obstructed my progress throughout this revision: Wait, where is that page I need? Oh, there it is, under the cat. Shoot—I need to look back a few pages, but they’re all…under the cat. The notepad I was JUST writing on? Yup. My kind-hearted teen son insists that Percy loves me and want to stay close. He likes the feel of paper. But I know that, with his one good eye, Percy sees straight into my worst self-doubt. You’re right, he purrs. You give this book to the world and you give yourself. Better to let me hide it, hide you. Cats are not without mercy. So if cats get in the way, maybe it’s because we need them to. For a while. Maybe we need the writing, the revealing, to go more slowly. We need to take our time and work hard for it. 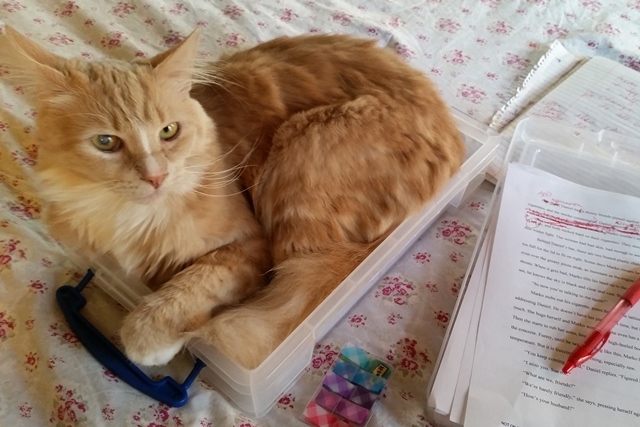 Maybe it’s not contrariness but compassion that leads a cat to curl upon a stack of unpublished work, smooth with sharp edges, full of possibility and potential disaster. « Thank you for hearing me.